County Executive MaryEllen Odell was among the several Putnam officials who gathered as a new, large and easy-to-see sign advertising the Carmel location of the Department of Veterans Affairs V.A. Outpatient Clinic was unveiled. The Carmel Community Clinic is located in the Sterling Bank (formerly the Provident Bank) building and is located at 1875 Route 6 across from the PutnamPlazaShopping Center. 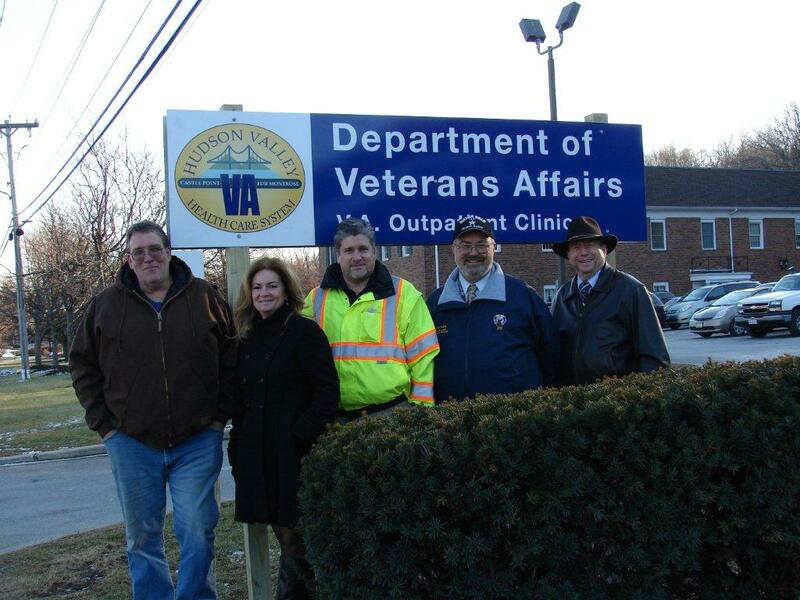 There are approximately 300 Veteran Centers throughout the United States and its territories. The centers, of which the Carmel Community Clinic is one, are for Veterans who have served in any combat zone and their families. The centers offer a broad range of counseling, outreach, and referral services. The Carmel Clinic is operated by the VA Hudson Valley Health Care System, a patient-centered, integrated health care organization providing health care, research, and education. The Carmel location offers area Veterans mental health, social work, podiatry, optometry, EKG, nursing, nutrition, and primary care services. The clinic also has its own laboratory. For a listing of the hours for each service, visit http://www.hudsonvalley.va.gov/locations/Carmel_Community_Clinic_Putnam_County.asp or call (845) 228-5291.